When I think about southwest cuisine, bowls of thick, red chile pozole from Santa Fe comes to mind, or soft pillowy sopapillas drizzled with sweet honey from Albuquerque. It’s food associated with a certain city. But as we were planning our tour of the southwest and mentioned stopping by Sedona, nothing came to mind. Nada. Rolling up from Phoenix on Highway 17 in our Toyota Camry XLE on a sweltering hot summer afternoon, Art and I moved along to Hwy 179 where we were greeted by deep, dark red steep canyon walls standing above us in towering formations like an oil painting on a canvas of crystal blue sky. The scene: absolutely breathtaking. As Art navigated the winding road, I was in the passenger seat like a little boy seeing for the first time something marvelous. I kept cranking my head around like an owl, trying to see what I could see and snapping away on my camera phone. 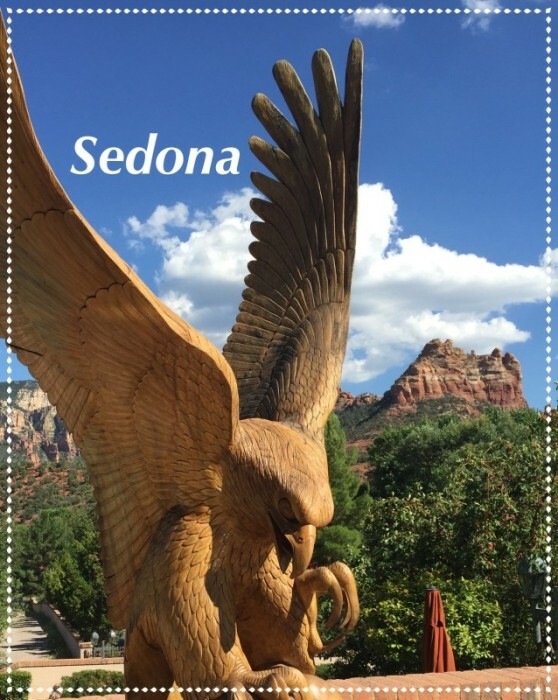 Surrounded by 1.8 million acres of national forest land, there’s plenty to do in Sedona, from sightseeing to hiking, to experiencing the spiritual energy vortexes recognized as a place of healing and spiritual renewal from Native Americans. You can ride along bouncy PINK jeeps in the canyons or simply stroll along in town, leisurely shopping. Make no mistake, traveling to Sedona in the height of summer you’ll be entering temperature zones over 100 degrees. My husband and I had all these lofty ideas of waking up in the morning and going for long hikes up the mountains to the energy vortex. Ha! Who were we kidding? By 8 a.m. it was close to 90 degrees already. At this beautiful Best Western right in the heart of Sedona, we opted to stay in bed cuddled under the blankets saying we were “coldies” with the air blasting in our room. About 10 a.m. we darted for our car, turned on the air conditioning and drove one mile down the road to a restaurant for breakfast. Oh, don’t’ worry, we still saw the breathtaking views. You can’t miss them no matter where you go in Sedona. 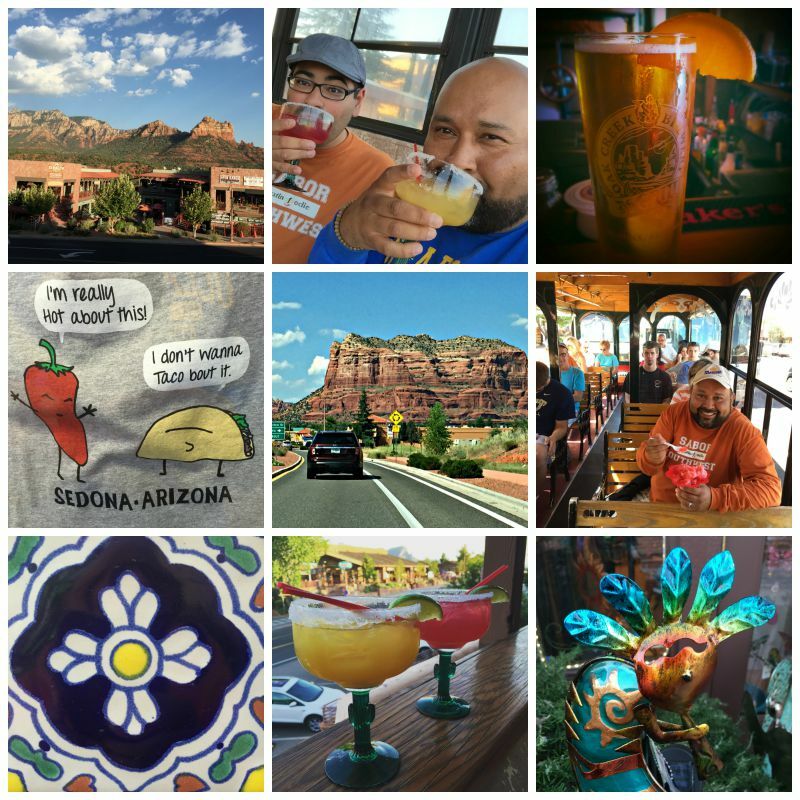 Our daily excursions took us on a trolley car to key landmarks where we got off to take selfies with the red rocks, a shopping and restaurant square called Tlaquepaque, designed after the famous plaza in Guadalajara, Mexico. There we ate at the super touristy El Rincon Restaurant. The heat wore us down and so we found ourselves seeking refuge at the very chill Oak Creek Brewery and grill, sipping craft beers. I think I would’ve liked their food better than El Rincon’s. MARIPOSA RESTAURANT — AN ABSOLUTE MUST SEE! The entire restaurant starting from the driveway is impeccable and even though the food is good, very good, it is the backdrop of the red rock cliffs that takes it to a spectacular experience. 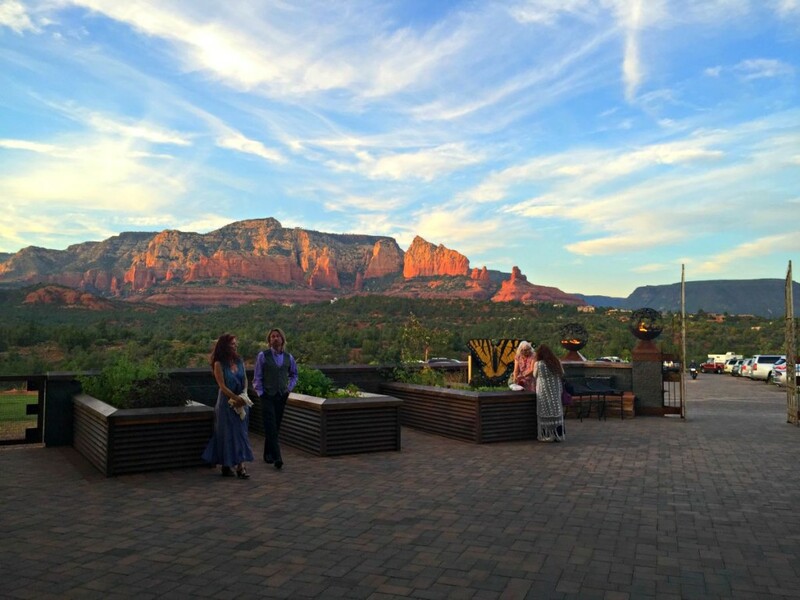 It was probably one of the most beautiful views I’ve ever had at a restaurant.The restaurant’s visionary, Chef Lisa Dahl, a prominent Executive Chef, author, and restaurateur is known for bringing fine continental dining to Sedona. While her past ventures have leaned toward Italian, her latest venture, Mariposa, brings you amazing South American/Modern New Mexican cuisine. We enjoyed excellent food and drinks in a breathtaking setting that made me feel suspended in the air above one of the world’s most distinctive topographies. The restaurant, including the outdoor terraces and bar seats about 300 people. The 25-foot exhibition kitchen showcases the glowing fire of an authentic Argentinian Parilla paired with a large wood-fired oven. If you go, make reservations for outside patio and get there before the sun sets or you’ll miss the red rock glory, but you will see sparkling stars shining brightly on a deep black canvas. We started off dinner with the Triple Queso, Truffle Mac & Cheese. It was a small crock of pale yellow elbow noodles, with a parmesan crust. If you’re wondering, our waiter/sommelier told us the other two cheese are chevre and gorgonzola. This mac & cheese is creamy, cheesy and has just a kiss of truffle, which is important or otherwise the flavor can turn bitter. Art ordered the Pollo Rustico, a heavenly wood roasted half chicken marinated in lemon, curry and rosemary served on a bed of charred summer corn. The skin was almost blackened, but perfectly crispy. He kept having to swoosh my fork away as I tried to sneak in bites every time he wasn’t looking. I did like his dish the best. I opted for the fish, a Black Grouper with Campari fire roasted tomatoes and corn, white wine and herb butter, black beans, and a quinoa pilaf. While my plate looked like a hot mess, it was light and moist and my mouth waters just thinking of that white wine and herb butter sauce. The young restaurant definitely delivers on scenery, craft cocktails (Bolivian Mule!) and flavorful food, but the unique black plates seemed wrong for the food and the juices ran wild, making for sloppy presentations. They were also out of three things when we went: a wine, flatbread, and skirt steak so make reservations and get there early. Set in the heart of touristy downtown Sedona, amidst all of the jewelry and boutique shops, is one of the older restaurants in town, the Cowboy Club. 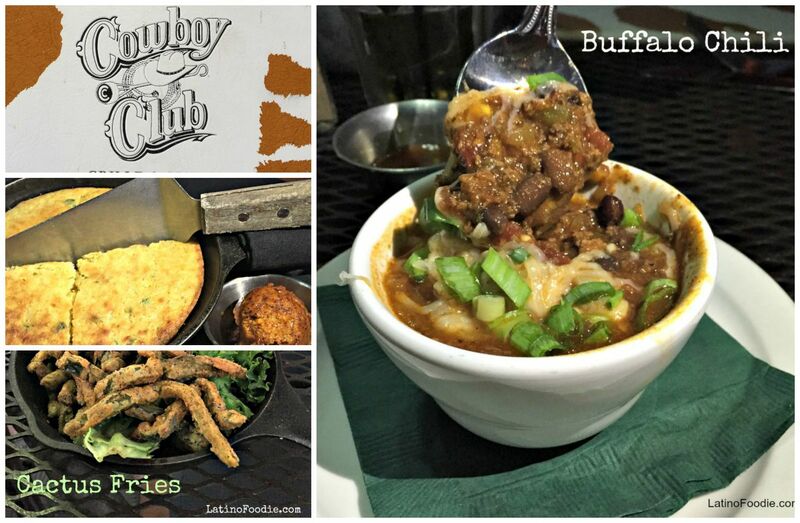 It embodies the western spirit and serves everything from rattlesnake sausage to buffalo brochettes. Like most places in downtown Sedona, it may seem like a tourist trap, but stop in for quick bite and give it a try. Established in 1946 as the Tavern, Sedona became the spot where more than 50 movies were filmed and when the day’s shooting was done, everyone would head to the Tavern: John Wayne, Burt Lancaster, Jane Wyman, Burl Ives, Maureen O’Hara, Robert Mitchum, Hedy Lamarr, Glenn Ford, James Stewart, Rock Hudson, Donna Reed, Gene Autry, Joan Crawford, ~ to name a few ~ were known to enjoy the warm fire and spirits at the tavern. The restaurant was bought and renamed The Cowboy Club, but the spirit of the west remains the same. We sat outside on the large sidewalk cafe and ordered a number of small plates. Cactus Fries — Flash fried, crispy cactus strips with prickly pear dipping sauce. Don’t expect fried taters, these are breaded, which provides a crispy skin, and the nopales are tender and not a bit, um, mucusy. Corn Bread — Homemade sweet corn bread was wonderfully dense and served in small skillet with honey chipotle butter. 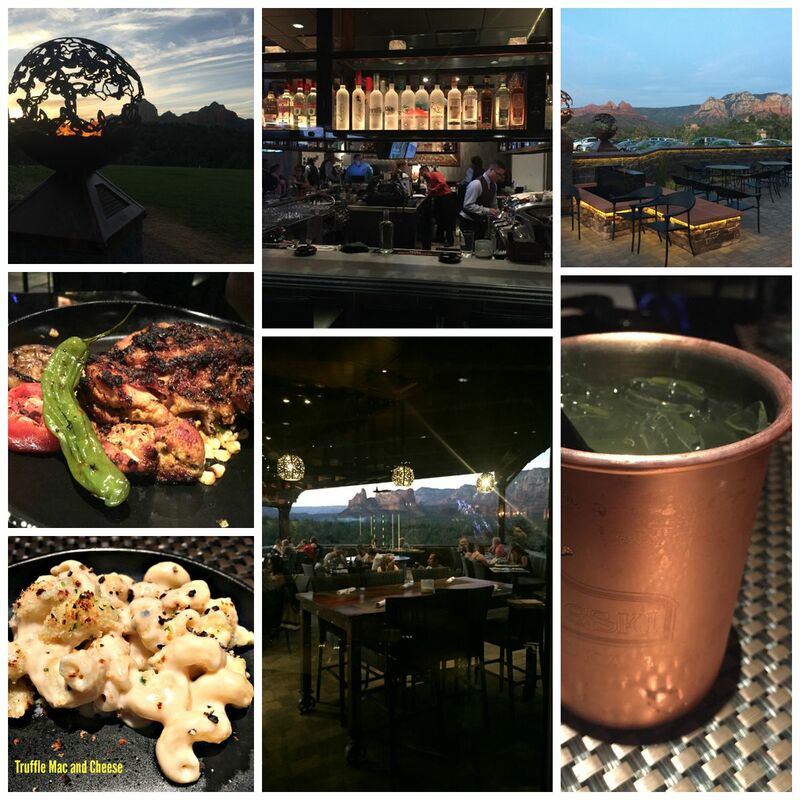 The outside patio has the signature red rock view, but inside the restaurant has good a/c and a fine bar. 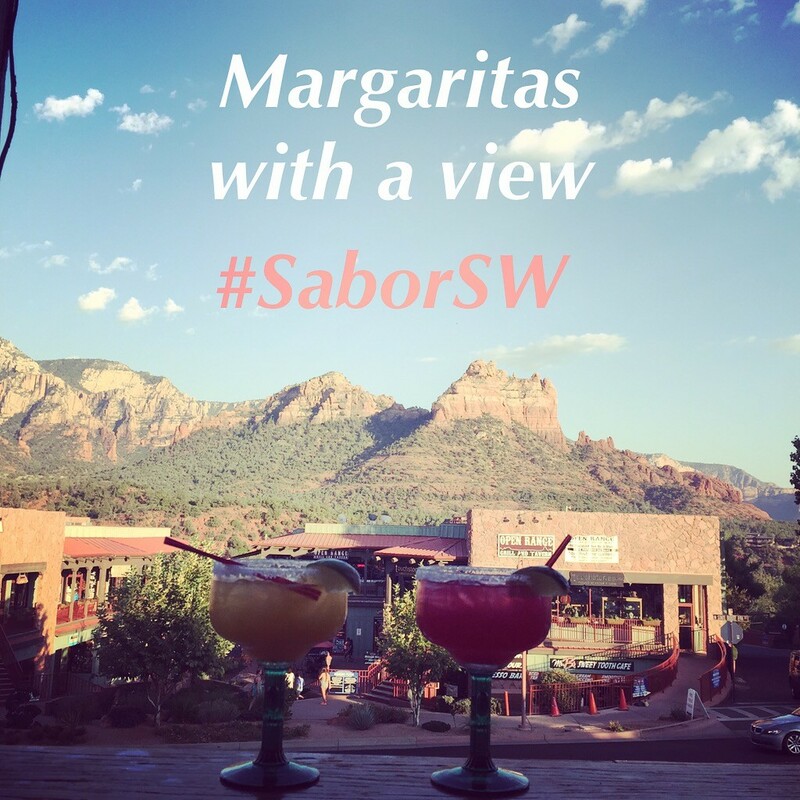 Like most margaritas in Sedona, they may be big but a little weak. Order it with an extra shot of tequila and enjoy. Thanks! Yes, it was tons of fun. You must go back and hit up Elote and Mariposa restaurant. You’ll love them!